Unfortunately for Aussie fans, the troubling times are set to occur in the short term and for the foreseeable future. 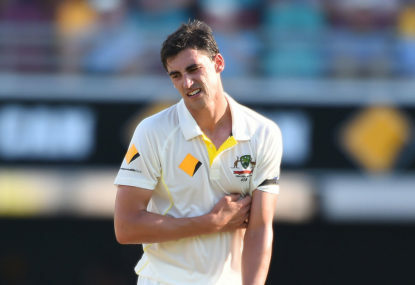 So, just how have the likes of Mitch Starc, Josh Hazelwood, Pat Cummins and Nathan Lyon gone from being one of the world’s most-feared attacks into cannon fodder? It hasn’t taken long but they rarely looked like threatening the Indians at all. Jokes aside. people are within their rights to question whether the use of sandpaper was more than just a one-off event? After all we’ve seen none of the prodigious reverse swing, the kind we were accustomed to seeing, the kind which rooted England in the last Ashes, in the latest Indian Test series. Now that the scrutiny is on the Aussies, where has the swing gone? I’d suggest that getting to the core of this very un-Australian problem is a little more complex than an appeal to P-90 grit. My own personal belief is that the change of culture, personified by the lack of mongrel and the loss of the ‘win at all costs mentality’ has significantly reduced the potency of the Aussie attack. With this new ideology – including a commitment to whatever elite honesty is – the Aussie team will continue to fail until they return to their old ways. It’s like trying to fire missiles from a BB gun. The powder is dry but the gun is missing. Australia built themselves into being the best and most fearsome attack in world cricket through a tough, uncompromising attitude. Now, they look a shadow of their former selves. What are your thoughts about the struggling Aussie pace attack?